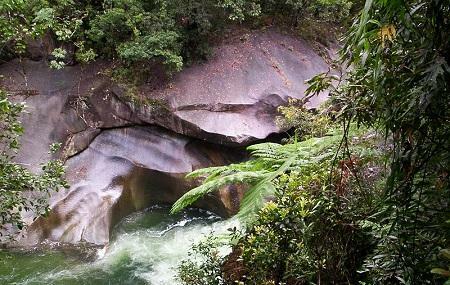 Also known as the Devil’s pool, Babinda Boulders is located in Queensland, Australia and is about 1-hour drive from Cairns. If you want to experience sheer scenery, take this trip to this natural pool which is a hidden paradise to nature lovers. As one of the most beautiful attractions in town, you can explore the mountain streams, pristine rainforests and witness a remarkable waterfall. The area also offers walking trails in abundance, in case you’d like to walk around and adore the surroundings. Babinda Boulders is well-maintained, and you can also have a BBQ setting and have a great get together. The swimming area is spectacular, so head there for a swim in the crystal-clear waters! The boulders is a great place to rest. The camp grounds allow 3 nights accommodation in a 2 week period. Cold showers and no service or power. The swimming hole is perfect. And really cold. There is also walking tracks to view the Boulders. Always good but need to obey signs regarding swimming particularly at moment as strong water flow after rain.has toilet and change facilities plus good covered areas to eat.Good photo opportunities. Awesome place for family. When we here it was raining, the current aren't so bad, we could still swim in. It seems like it merge from two rivers. Best way to cool off in the hot weather of North Queensland. Ample parking and change rooms available. Absolutely stunning place to visit, with gorgeous scenery that I also recommend having a swim in as the water there is beautiful.